PLA or Polylactic acid is a biodegradable thermoplastic made from biological resources such as corn starch. It melts at a lower temperature than ABS and is alot more forgiving. Therefore every roll keeps its specific filament width throughout the entire length leading to less extruder jams and higher quality and accuracy in your printed parts. 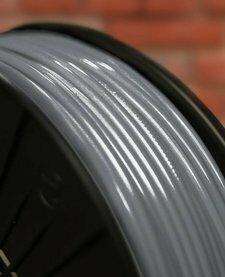 Our excellent quality PLA is specially formulated for much higher tensile strength and great interlayer adhesion. We have a wide range of colors designed to match the RAL color system. Our superior production process ensures every roll keeps its specific filament width throughout the entire length leading to less extruder jams, a higher quality finish and more accuracy in your printed parts. Prototypes, visual models, unique or small series productions. Finishing processes such as sanding, cutting or drilling are possible. Parts can be attached using standard super glue and similar adhesives. PLA 3D printed objects can be cleanly burn out of plaster molds in an oven, leaving a mold which can be used with metals. This technique is called "lost PLA casting". Stronger and less fragile than normal PLA. Easily printable at low temperature. 3D printing directly on a heated bed or non-heated bed. Good non-heated bed adhesion is achieved using blue painters tape or dedicated solutions such as Build Tac. Weaker than various engineering plastics. PLA can melt at relatively low temperatures (around 55 degrees) and is less suitable for outdoor use. Our excellent quality PLA is specially formulated for much higher tensile strength and great interlayer adhesion. It comes in a range of vibrant colours and is created with a far superior production process. Our excellent quality ABS 3DM is specially formulated to have a wonderful interlayer adhesion and no warping factor. It is even tougher than standard ABS and comes in a range of vibrant colours. Our excellent quality ABS 3D Exponential is specially formulated to have a wonderful interlayer adhesion and no warping factor. It is even tougher than standard ABS and comes in a range of vibrant colours.